The Trifecta is what I define as the 3 methods to make money from your passion: Client Work, Products, and Teaching. While The Trifecta is something I’ve talked about in many shows, we’re doing an in-depth, 3-part series to focus specifically on the money-making aspects of each. 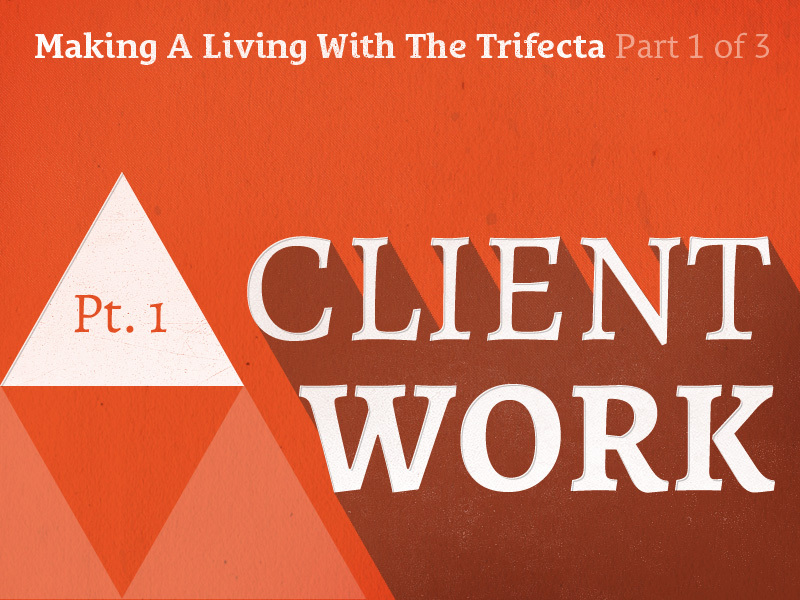 In Part 1, we dive into the many facets of client work—looking at everything from defining the right type of client, building a portfolio, getting clients, design professionalism, case studies, pro-bono, value-based pricing, and a whole lot of other good stuff to consider when working with clients. Tune in to hear a solid, foundational episode for making a living doing what you love in what will be yet another powerful 3-part series. 03:49 We’re taking all of this in the context of The Overlap Technique. In theory, you have a day job that’s paying your bills so you are approaching client work without a scarcity mindset. This is terrible advice—be selective. 04:19 The right type of client is one that values your expertise and is willing to come under your process (Related: e011 Defining the Right Type of Client). 05:13 Your General Process is something that should be on your website, displayed publicly, so clients can see how you work. You may have different processes displayed for different kinds of work. 05:49 Your Project-Specific Process is what you provide directly to your client. This is a tailored version of your General Process that takes the timeline, constraints, content, etc., and personalizes it. 06:48 The rule of reciprocity: When you go chasing clients, you’re basically asking an implied question: “Will you do me the favor of being my client?” This sets the wrong precedent, because then the client will feel like you owe them something, which will result in them being less likely to come under your process. 07:15 This is why we have The Overlap Technique. It’s super important not to let your income and sense of security rest on the question of, “Am I going to get a client?” When your bills are taken care of by something else, it frees you up to spend your extra time building your portfolio, attracting the right type of clients, and growing organically. 07:56 Whether it’s through practice, or going to school, or interning—you want to build up your skills. You may not have client work in the beginning, but you can do self-initiated projects. You can also do case studies on self-initiated projects. It doesn’t just have to be client work. Find problems to solve and write case studies around those projects. 09:00 Your process tells clients how you work, but case studies show clients how you work. 10:15 Clients don’t care about who your clients are. They care about how you solved a problem. 11:18 Think of an adequate number of portfolio items and double that number—now you’re getting close. 12:14 Build out your portfolio and establish a process, then make yourself available. Make it obvious that you are available for hire. 12:43 Ask questions up front so you can determine from the answers whether this is someone you want to work with. There’s no such thing as clients from hell because only designers from hell take on those type of clients. 16:10 You don’t want to say, “Do you have any existing ideas or concepts you’d like us to run with?” If you’re truly trying to find out if your client has any preconceptions, a better question is, “Are there any existing branding requirements that must be adhered to?” The way that you ask the question is very important. If you simply ask the client if they have ideas, they will fabricate them even if they didn’t previously have any simply because they assume you, as the professional, are asking for a reason. 17:07 Don’t make your ideal client jump through hoops. 19:49 The definition of a professional is someone who is actively seeking and acquiring responsibility. A novice will consistently try to put blame off on someone else. A professional seeks responsibility. When something goes wrong, you are actively looking for places where you can take responsibility for that having gone wrong. Something in your process could have prevented this problem from happening—find it, or implement it. 20:49 Don’t complain about the client taking advantage of the hole in your process—take it as feedback on what part of your process to patch and improve upon. You, as the professional, are responsible for every single problem that occurs. 24:21 Because it’s important. We’re talking about having a long-standing business. It’s the long game mindset—we want to set ourselves up for future success. That doesn’t come from taking on any type of client. You have to be selective. That’s what The Overlap Technique affords us: the ability to pursue client work without a scarcity mindset. 26:00 You don’t bring down your rate arbitrarily because their budget is lower. What you can do is remove features so long as it does not compromise the integrity of the project. Full price or free — those are your two choices. 26:35 Discounts devalue. The only exception is when it is rewarding loyalty. 30:15 Your time is valuable and payment should always be required up front. Payments are always non-refundable. When you’re starting out, no less than 50% up front. For international clients, I do 75% up front because you have almost zero legal leverage there if they drop the project or don’t pay. 32:17 As you get better, as your track record grows, and as you become more respected in your industry, you can define whatever terms you want. I’ve actually shifted to 100% up front in a lot of cases. “Well who’s going to do that?” The right type of client will do that. 33:00 Remember, a lot of other people are charging way more than you. What you charge for 100% could very well be someone else’s 50%. Don’t assume that the client isn’t going to have that much up front. Maybe you’re just in the wrong ballpark. Maybe you need to start thinking bigger. Maybe you need to start charging more. Get outside your comfort zone. Very likely, you are undercharging right now.If you’ve been doing what you’re doing for any length of time and haven’t raised your rates yet, you should raise your rates. Don’t be afraid to charge what you’re worth. If you possess the competence, doubling your rates rarely results in 50% client loss. 34:49 If you have to fire a client, guess whose fault that is? It’s your fault. It’s always the professional’s responsibility. “But… but the client…” No. It’s your responsibility. You did not set the right expectations and you did not do proper vetting of this client before you took them on. 35:42 The goal is always, “How can I accept responsibility?” Dig into this and find where you can accept responsibility. No matter what happens, accept that you should have asked certain questions up front that would have allowed you to prevent this problem. Build this into your questionnaire and iterate so the next time you’re able to prevent the last problems you had. 36:48 Charge for the value that you’re providing to the client (Related: e046 How to Make More Money Freelancing by Pricing Your Projects on Value). What is your time worth? Maybe you think of that in hourly terms, maybe you think of it in annual terms, but whatever that is, establish what your time is worth to you. You have various expenses such as hardware, software, internet, electricity, etc. What does it take to keep the lights on and what have you invested in your education? This has to be baked in. What kind of profit will the client realize in their bottom line as a result of your work? The client is the one who determines this—you have to ask the right questions to ascertain the value, but the client defines it. 38:52 If the client cannot articulate what your solution would mean to them in terms of value for their business, that indicates that the client is not in the position to hire you—or worse: that they think of you merely as an expense. Position yourself as an investment to your client, not an expense. 39:26 Most people position themselves as expenses: the focus is on their time, on their work, or on the number of concepts that they’re providing. 39:39 You need to position yourself as an investment. By asking questions about value, you are positioning the conversation around you being an investment. You’re focusing on the returns the client will get when they hire you. 40:35 Note: While Value-Based Pricing is comprised of the 3 above parts, only the third part is involved in your discussion with the client. Your time and cost are for your own internal reference. The value is what you discuss with the client. 42:11 Not necessarily. First of all, when you’re working with a consultant, you talk real numbers. That’s just how it is. You want them to help you make more money, right? That’s why you talk real numbers. What kind of impact is this going to have on your business? What kind of difference will this make on your bottom line? What kind of profits will you realize from this? 43:00 They may skirt some of the questions, but the idea is that you’re triangulating the actual value. Maybe you don’t get the numbers, but those kinds of questions are going to get your closer, and closer, and closer. 44:56 The client determines the value. You as the designer do not determine the value. The client has to be the one to say what this project is worth to them. Again, that may not be in numbers, but the client determines the value—your job is to ask the right questions so that the client will tell you what that value is in so many words.